[ Sir William Tite, architect. ] Autograph Letter Signed ('W Tite') to an unnamed recipient, regarding the unfitness of a 'young Friend' for an appointment. 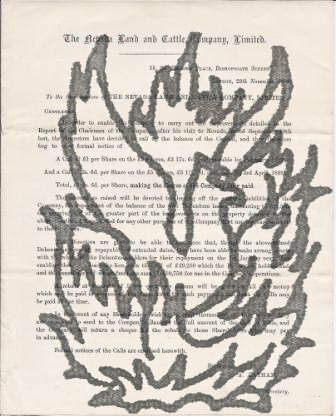 Place not decipherable, on inverted letterhead of 17 St. Helen's Place, E.C. [ London ] 'Friday' [ no date ]. 2pp., 12mo. Bifolium. In good condition, lightly-aged. He does not think the recipient's 'young Friend' would stand much chance gaining 'the Appointment', but does not see why 'he should not try & make himself known'. He continues: 'We want an experienced Man up to all the workings of the Acts for compulsory Purchases & the Tricks of fradulent Claimants'. Tite is afrait that the 'young Friend has this unpleasant Part of his Profession yet to learn'. He concludes by stating that there is 'but little Chance of my being in London at the Election'. [ Sir William Tite, architect. ] Autograph Note Signed ('William Tite') to J. Cole of Woodford. 1p., 12mo. In good condition, on lightly-aged paper, with traces of mount still adhering to reverse. From the context a response to a request for an autograph. Reads. 'Sir / | I beg to acknowledge the Receipt of your Letter & thus to answer it. | I am | Sir | Your obed Servant | William Tite'. [ Sir William Tite, architect. ] Autograph Note Signed ('Will Tite') to fellow-architect Charles Harriot Smith, regarding work he is doing for him on the Royal Exchange, London. With Autograph Note by Smith's wife Fanny Smith. 17 St Helen's Place [ London ]. 30 March 1843. 1p., 12mo. Bifolium. In good condition, lightly-aged. Reads: 'Dear Sir / | I have made up my mind not to decorate the Cymatium of the Exchange Cornce & I have also certified £1080 for you to-day'. Addressed to Smith at 29 Clipstone Road. Smith's entry in the Oxford DNB states that he 'executed the ornamental stonecarving of the Royal Exchange, of the National Gallery, and of Dorchester and Bridgewater houses. Three albums filled with English and German manuscript memoranda, newspaper cuttings and mimeographed reports, relating to the Great War and 1898-1909 periods, assembled by an Anglo-German stockbroker in the City of London. Manuscript album, in German, 1898 to 1909, with label of a Hamburg stationer. Two other albums from 1917, with labels of London stationers. The three items come from the papers of an Anglo-German City of London stockbroker, with Item One, below, indicating that he was based in Germany between 1898 and 1909, and that he had moved to England by 1917. A major point of interest is the fact that the material has been assembled by an educated, intelligent and well-informed individual with good knowledge of both German and English economic realities, at a time of high conflict between the two nations. ONE: 94pp., folio. In black cloth quarter-binding with brown marbled boards, and label of W. Harneit, Hamburg. Consisting of 88pp. 1p., folio. 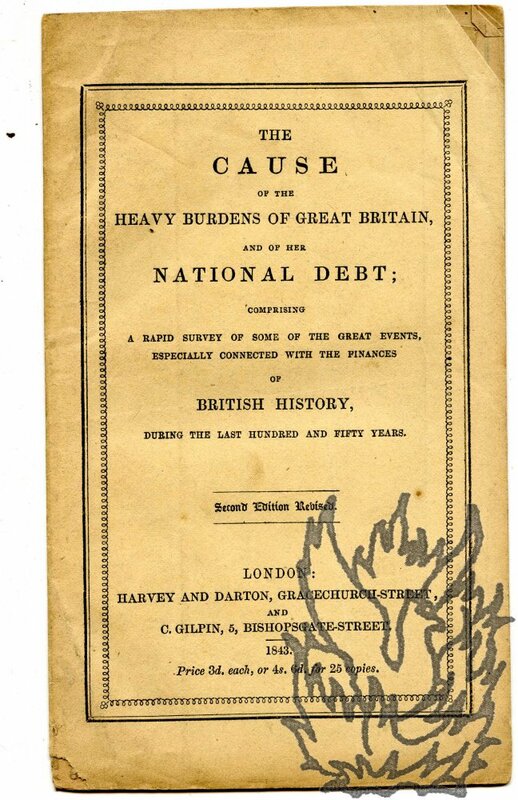 In fair condition, on aged and worn paper, with slight damage at head from breaking of seal, causing loss of the 'SC' in the heading 'PRICES OF OTTISH STOCKS.' Table in small print, subdivided into sections on Banks, Insurance Companies, Railways, Miscellaneous and English Railways, with columns for: Advanced Capital; Annual Dividend; When Payable; Return per Ct. to Purchaser; Description of Stocks; Shares; Present Selling Prices. Letter, in a secretarial hand, signed by P. A. Latham, secretary of the Nevada Land and Cattle Company, Limited, to Sir James Kitson, regarding his '1000 shares', enclosing a printed circular by Latham on the Company's behalf. Letter: 13 December 1888; on letterhead of the Nevada Land and Cattle Company Limited, 15 St Helen's Place, Bishopsgate Street, London. Circular: 29 November 1888; from the same address. Both items good, on lightly-aged paper. LETTER: 4to, 2 pp. 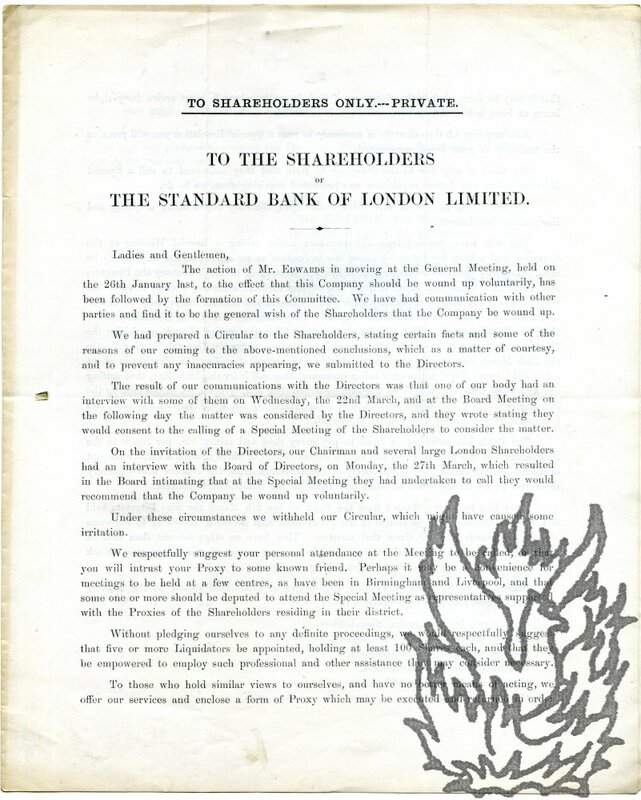 He is enclosing the 'circular letter recently sent out to all the shareholders of this Company, whose shares are not fully paid', but as Kitson has 'paid in full in advance of calls on the 1000 shares' in his name 'by way of Loan to the Company', he informs him of the sum to be transferred to his account. 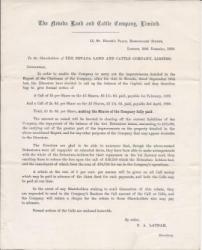 On 3 April 1889 Kitson's 'loan a/c will be closed and your shares will be fully paid'. 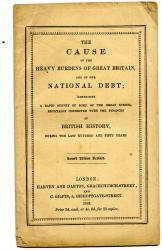 CIRCULAR: 4to, 1 p.
The Cause of the Heavy Burdens of Great Britain, and of her National Debt; comprising a rapid survey of some of the great events, especially connected with the finances of British History, during the last hundred and fifty years. 12mo, 12 pp, and fold-out frontispiece of table showing the 'British National Debt, funded and unfunded, stated in millions of pounds sterling' from 1689 to 1843, with four other columns. Stitched and in original printed wraps. Text clear and complete. Several copies of varying condition. Usually Fair: lightly-aged and creased. Scarce: other than electronic reproductions, COPAC only lists copies of this second edition at the Bodleian and British Library. 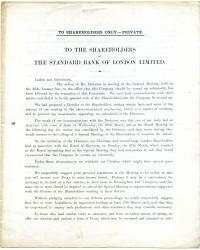 A printed circular by 'Members of the Birmingham Committee of Shareholders', addressed 'To the Shareholders of the Standard Bank of London Limited', with a lithographed facsimile letter from the firm's liquidator Leslie, and a share prospectus. Circular dated 'Committee Room, 116, Colmore Row, Birmingham, 27th April, 1882.' 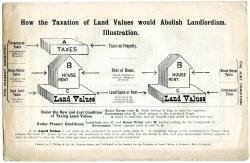 ['Printed by JOSIAH ALLEN, Birmingham.'] Lithograph dated 8 May 1882. Prospectus: 10 December 1880. 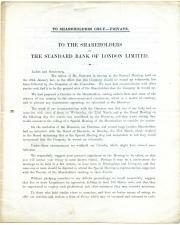 According to the prospectus (item three below), the Bank was 'Incorporated under the Companies' Acts, 1862, 1867, 1877 and 1879.' The three items were formerly pinned together. Item One (printed circular): 4to, 4 pp. Bifolium. Good, on lightly-aged paper. Headed 'TO SHAREHOLDERS ONLY. - PRIVATE.' Signed in type by seven 'Members of the Birmingham Committee of Shareholders'. The first paragraph reads 'The action of Mr.
Handbill, with diagram, expounding the aims of the Society, headed 'Meetings along the Line of Docks'. 12mo bifolium (leaf dimensions 22 x 14 cm): 4 pp. Text clear and complete, on lightly-aged and grubby paper with wear to extremities. The first pages includes a section beginning 'Land in Liverpool has been sold at £226 the square yard; £1,093,840 an Acre! | PAY YOUR RENTS! and YOUR RATES!! | You must Pay them or be Put Out!!! 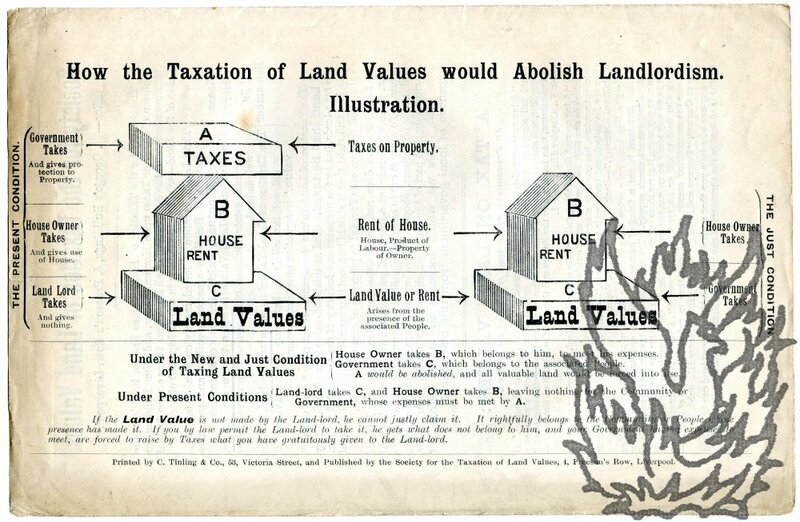 | But when you pay, think what you are paying for: [...] The Liverpool Stock Exchange had to pay Three Shillings and Sixpence for every square inch of the land facing Exchange Street and corner of Dale Street. There are over 6 1/4 million square inches in an acre!